At a time when print newsrooms continue to shed jobs, thousands of journalists are now working in the growing world of native digital news—at small non-profits like Charlottesville Tomorrow, big commercial sites like The Huffington Post and other content outlets, like BuzzFeed, that have moved into original news reporting. In a significant shift in the editorial ecosystem, most of these jobs have been created in the past half dozen years, and many have materialized within the last year alone, according to this new report on shifts in reporting power. Since the fall of 2013, there has been a dramatic and conspicuous migration of high-profile journalists to digital news ventures. In October, Yahoo hired high-profile New York Times tech columnist David Pogue, who was followed a month later by Times political writer Matt Bai. In late October, former Times assistant managing editor Jim Roberts became chief content officer at Mashable’s growing news operation. Also in October eBay founder Pierre Omidyar announced that his digital startup, First Look Media, would be spearheaded by the Guardian’s Glenn Greenwald, famed for publishing Edward Snowden’s leaked NSA documents. And BuzzFeed brought on Pulitzer Prize-winner Mark Schoofs (previously at ProPublica, The Wall Street Journal and The Village Voice) to run a new investigative team. The pace picked up again in January 2014, when the Washington Post’s Ezra Klein took his Project X journalism concept (now known as Vox.com) to Vox Media. And in February, former New York Times executive editor Bill Keller announced that he would become editor of The Marshall Project, a new nonprofit focusing on criminal justice issues. All this movement is merely the tip of the iceberg for a digital native news universe that includes not only dozens of highly publicized national and international organizations, but also hundreds of smaller digital news entities, mainly filling targeted news niches. And it is occurring at a time when print newsrooms continue to shed jobs and when local television news jobs, while holding steady, often are being stretched thinner to produce more content than in the past. The Pew Research Center made a first effort to put a number on the shifting journalism landscape by using interviews and multiple data bases to account for editorial staffing at 30 major digital news organizations and 438 smaller ones. Those 468 outlets—the vast majority of which started in the past decade—have produced almost 5,000 full-time editorial jobs.1 While that does not represent a complete census of a digital news world, it is a robust a sample as may be possible from a variety of credible sources. Still, purely in terms of bodies, the growth in new digital full-time journalism jobs seems to have compensated for only a modest percentage of the lost legacy jobs in newspaper newsrooms alone in the past decade. From 2003 to 2012, the American Society of News Editors documented a loss of 16,200 full-time newspaper newsroom jobs while Ad Age recorded a decline of 38,000 magazine jobs, which includes all jobs for the entire consumer magazine sector. Such job cuts continued in 2013 and early 2014—at such big organizations as the Tribune Co. and Time Inc. The accelerating shift of talent to digital news jobs has significant implications for the U.S. news consumer. Many digital outlets are working to fill reporting gaps created by the strain on resources at traditional outlets—from niche topic areas like education to international coverage to local community news to investigative journalism. One of the larger cohorts—the digital investigative outlets—ranges from the Pulitzer Prize winning ProPublica to the 73 digital news operations in the five-year-old nonprofit Investigative News Network. Other digital news producers, especially those that have emerged most recently at the national level, are aimed at cultivating new forms of storytelling—from video to crowdsourcing to new documentary styles—and new ways to connect with audiences, often younger ones. A number of legacy outlets are also experimenting with new storytelling and data visualization techniques. But much of the innovation is coming from the digital native sector, with many outlets focused on hiring people with skills and voices “being nurtured online,” as one editor put it. Some of this coverage, particularly at the local level, can be inexpensive to produce and can require only modest resources. But the question of whether digital news outlets can ultimately replenish the loss of legacy jobs and reporting resources hinges on creating the kind of successful business model or models that have proved elusive. Many native digital outlets are still unprofitable and there is a finite supply of billionaires willing to spend $250 million on a startup. Most analysts say this growing investment in digital news does not mean the industry has figured out a consistent formula for monetizing that news. Have additional data on digital news outlets? Please share it with us to help inform the research. The data Pew Research used to track the shifting job market in news came from several sources. The staffing data for the 30 larger native digital organizations came primarily from interviews—conducted both via phone and email—with representatives of 28 of the 30 organizations. The staffing information for the remaining two outlets came from media accounts. The staffing data from the universe of smaller sites was derived by merging five lists totaling more than 500 digital news organizations. That figure that was whittled down to 438 when duplicate outlets and sites that were not applicable or about which little data could be found were discarded. The staff numbers for the individual sites came from survey results, information collected by those compiling the lists and staffing levels listed on outlet websites. The job numbers from legacy media outlets came from data compiled by the American Society of Newspaper Editors, Ad Age, the Radio Television Digital News Association and Hofstra University and Pew Research data. At some of the digital natives, the rate of hiring has been explosive. Two years ago, BuzzFeed had about a half dozen editorial employees. Now it has at least 170.2 Three years ago, Bleacher Report had no paid writers; now there are about 50. The rapidly expanding global Vice Media operation has already hired 48 more staffers in the U.S. this year alone. Henry Blodget has plans to increase the Business Insider editorial staff of 70 by 33% this year. And startups like First Look Media, Project X and the new FiveThirtyEight blog have thus far hired a total of about 60 editorial staffers in the last few months. Many of the native digital news organizations are small, nonprofit and young. 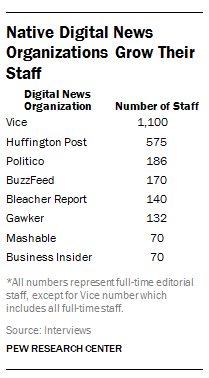 Of the 438 smaller sites examined, more than half (241) have three full-time staffers or less. It is also clear that the nonprofit business model is an attractive option for many of these outlets. In our sample, slightly more than half of the 402 organizations where we could identify a business status were nonprofits (204.) And many of them are very new. Nearly 30% (120) of the smaller outlets for which we have starting dates have come into existence since 2010. Fully 85% were started since 2005. Many of the smaller digital organizations focus on filling reporting gaps in local news and investigative journalism. Among the smaller organizations studied, more than half (231) identify themselves as primarily local or hyperlocal outlets—often covering events at the neighborhood level. Nearly four dozen (45) identify themselves as investigative in nature. In addition, several of the largest nonprofits—ProPublica, the Center for Public Integrity and the Center for Investigative Reporting—produce investigative journalism, often in collaboration with legacy news organizations. Among the larger digital outlets, a number are investing substantially in global coverage. The editorial focus of the 30 larger sites ranges from sports (Bleacher Report) to tech (Re/Code) to investigative (ProPublica.) But some of the general interest outlets are expanding overseas in a significant way: The Huffington Post wants to grow its reach to 15 countries from 11 this year; Vice has 35 overseas bureaus; BuzzFeed hired a foreign editor to oversee its expansion into such places as Mumbai, Mexico City, Berlin and Tokyo. The two-year old business-oriented Quartz has reporters in London, Bangkok and Hong Kong and its editorial staff speaks 19 languages. Digital news organizations are hiring a mix of legacy and non-legacy journalists, with a clear emphasis on new storytelling skills. One area where legacy skills are in demand is investigative work. The Investigative News Network estimates that at least 80% of the journalists working at its 92 outlets are from legacy jobs. At ProPublica, 25 of its 41 staffers are legacy transfers. But increasingly, editors of digital natives say they are hiring younger staffers with better digital instincts and skills. “The training of traditional journalism is not perfectly suited to what digital audiences are looking to read,” says Quartz editor-in-chief Kevin Delaney. The loss of legacy media jobs in recent years has been concentrated in the print sector. The American Society of Newspaper Editors counted 38,000 full-time newsroom jobs in 2012, down from more than 54,000 a decade earlier. And in 2013, there were hundreds of new layoffs at such companies as Gannett and Tribune. The Ad Age Data Bank, which tracks all magazine industry jobs, said 26% of magazine jobs were lost in the past decade. That does not include more recent layoffs such as the 500 overall Time Inc. cuts recently announced as part of a corporate restructuring. How Big Is the Digital News World? Is There a Business Model to Sustain Digital Native News?